Radiant Cut diamonds were originally developed by Henry Grossbard in 1977. He introduced the world to a new cult of diamonds that had cut corners. Radiant cut diamonds subtly combines the elegance of traditional diamonds, and for enhanced sparkle they take inspiration from the round brilliant cut. If used on two carat diamonds, the beauty of the radiant cut takes on newer levels. The ring you see in the picture is a breathtaking Cubic Zirconia ring that features a 2 carat Radiant cut diamond in the centre. 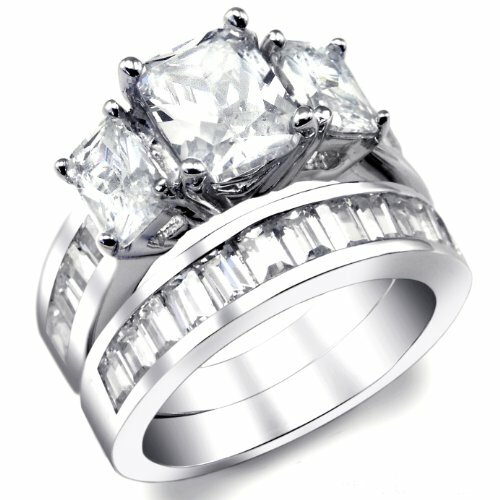 The diamond ring has been given a rhodium finish in order to prevent the white gold from tarnishing. If perfect intricacy, design allure and value is what you are seeking, this amazingly gorgeous ring is the answer to it. It features two other side stone that around the centre, prong set with smaller diamonds. From the looks of it, one sees it as a prospective engagement and proposal ring. A two carat radiant cut diamond ring what more can you ask for? But, one look at this next ring and you know you can actually ask for much more. Featuring a 2 carat center stone in a four prong setting, the ring features a multitude of diamonds that cover the entire band. These tiny diamonds add to the overall sparkle of the center stone, and drape the ring is a rich and sophisticated design. Each diamond is distinctly visible and it won’t be hard for onlookers to count the diamonds studded in the ring. Women are going to go bonkers over this one if your pocket can afford the ring. 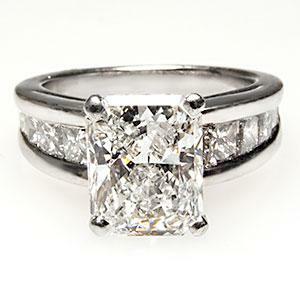 The stunning platinum ring features a GIA certified 2 carat radiant cut diamond center stone. The stone has a grading G in color and clarity of S12. 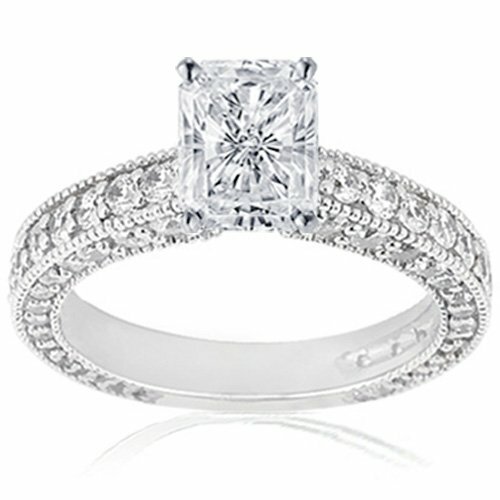 Adorning the center stone are 10 high quality channel set princess cut diamonds. Magnificent as it looks, the ring is a sparkling gem that takes one’s breadth away in the first look. 2 Carat Radiant diamond solitaire ring draped in full elegance and sophistication, this ring features a simple yet enchanting design. It looks more chick than traditional, and is perfect for everyday wear. 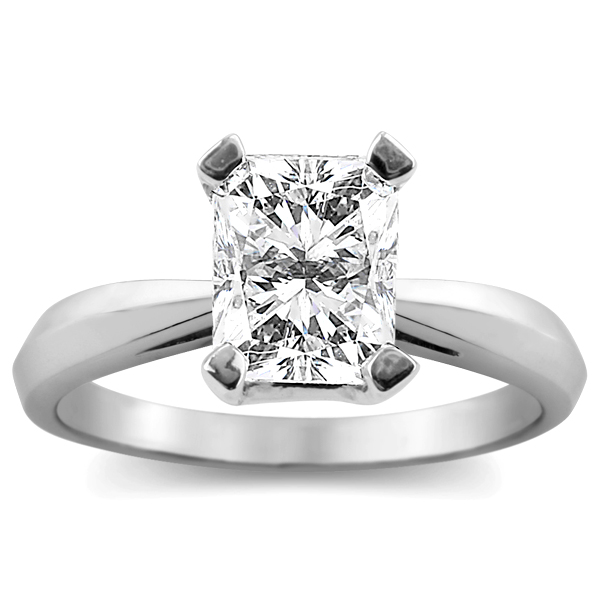 Featuring a single center stone in a four prong setting, the ring it looks beautiful in a 14 k white gold band. Furthermore the centre stone holds color E and clarity VS1, and is GIA certified. Diamonds are truly precious, but with so many people affording the one carat diamonds, the rare character of the stone has been lost somewhere. If, it is rarity you are looking for, you 2 carat diamonds still hold a well off position. Search the internet, jeweler shops and you will only find a handful of beautiful 2 carat radiant cut diamond rings.